‘Restricted view’ of London’s theatre? This is a short blog post offering the tricks of the trade when it comes to being a student and theatre-lover in London. We are too often pinching pennies, so how do we afford London’s theatre? 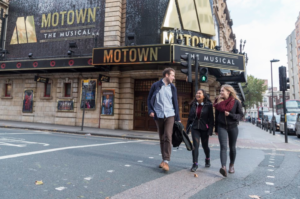 With tickets going for up to £145, it is no wonder the theatre seems inaccessible. The Globe Theatre in Southbank, a recreation of the original, offers £5 ‘groundling’ (i.e. standing) tickets to Shakespeare plays. While these are often still available a few weeks in advance during the winter season, summer tickets sell out as tourist season arrives. I recommend booking a few months in advance. Sadly, the £10 standing tickets at the adjacent Sam Wanamaker Playhouse are not worth getting, since they really are ‘restricted view’ and obscured by chandeliers. It is, however, worth forking out just the once for a seat there, since the Playhouse is a faithfully recreated Jacobean theatre and is utterly charming. The National Theatre offers a season of £15 tickets, subsidised by Travelex. These are ‘restricted view’ but worth it. I have sat in the first row, left-hand stalls, at the Olivier Theatre for Brian Friel’s ‘Translations’.The back of the set was entirely hidden from view but, thankfully, I missed no action. While there was a unique intimacy in seeing the actors’ faces so closely, I would recommend the gallery tickets of the same price. The Royal Shakespeare Company and the Barbican both have student schemes, easily joined via their websites. It is useful to join both. Once part of these, you receive an email when tickets for the next season become available, and these are offered to you for as little as £10. I have been to both the theatre in Stratford upon Avon and the Barbican for RSC performances. The most recent ‘Anthony and Cleopatra’ at the Barbican was outstanding, with its moving, experimental music and a Cleopatra both resplendent and powerful on stage. I will finish with a few useful tips. Firstly, scope out the seating plans for various London theatres on Theatre Monkey to see if your restricted view seats are worth it, since not all of them are created equal. The website offers reviews and ratings on particular seats, as they relate to their prices, and any ‘red’ seats are to be avoided. Secondly, keep an eye on key theatres for their restricted view seats. I have recently (and, it feels, impossibly) booked £15 tickets for Ian McKellen’s ‘King Lear’ at the Duke of York theatre. These may not be the best seats in the house but I am ecstatic not to be missing such a seminal performance.